The sign said “BE A PART OF HISTORY!”, so Slim signed on as a volunteer for the restoration of the #223. Being a bit of an adventurer, and because her granddad was an engineer on the Santa Fe, she figured she must have railroad DNA. Her granddad had the run from Prescott to Seligman Arizona. Her aunt was a telegrapher for the Santa Fe which also helped convince her to sign up. Slim came to Ogden as a dispatcher with a trucking firm (she had also been a driver) so transportation was once again in her life. When growing up, Slim learned how to use her hands around the family horses swinging a hammer and is comfortable around tools. Slim enjoys the comradeship in the shop. She is part of the hot riveting team and feels like after literally thousands of hot rivets pounded into the tender, the team is almost family. 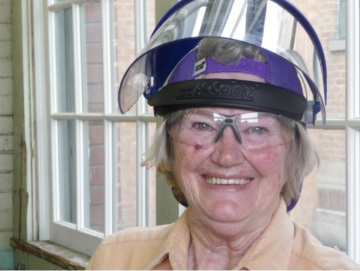 Slim feels that volunteering in the shop is an opportunity to learn new skills. Slim feels that once #223 is completely restored, people will come to see an operating steam engine. When people see the engine they may even remember a relative that they too had who worked on the railroad.